Layers of graham cracker crumbs, roasted Campfire® Marshmallows, hazelnut spread, and fresh strawberries create the perfect s’mores trifle worthy of any summer celebration. If you followed My Baking Addiction during my pregnancy, you may remember my infatuation with all things s’mores. I think I ate a basic s’more almost every single night from month 4 to month 9. Sometimes I’d get all fancy schmancy and roast my marshmallows on a fork over our stove; however, more often than not, I’d take the lazy route and pop them into the microwave for a few seconds. Eventually Eric took over as the s’more chef and in no time, he perfected the “recipe” for a microwave s’more. And I must say he was pretty proud of his technique which included precise marshmallow positioning and exact timing. I’m telling ya – he had it down to a science and they were amazing. Even though I had Elle 4 months ago, I still crave a good s’more every now and then. And this past Memorial Day’s perfect weather set the stage for a weekend full of s’mores! Since it was a holiday weekend, I wanted to kick up my s’mores dessert to a whole new level. And by layering graham cracker crumbs with roasted Campfire® Marshmallows, hazelnut spread, and fresh strawberries – I think I accomplished just that. Just don’t be fooled by gorgeous layering in pretty glasses, these s’mores trifles are every bit as ooey and gooey as a traditional s’more – because really, what’s a s’more without the mess? I’m completely obsessed with Campfire® Marshmallows – not only are they delicious, but they have that perfect ooey-gooey factor that’s so important when making s’mores! As you may remember from my Key Lime Marshmallow Milkshake post, I’m partnering with Emily from Jelly Toast and Campfire® Marshmallows over the next year. You’ll see more recipes from us, and hopefully even more exciting stuff as the year goes on. Be sure to check out Emily’s post for Marshmallow No-Churn Ice Cream made with Campfire® Mallow Bursts. We even created a Marshmallow Madness Pin Board where we’ll Pinning all of our favorite marshmallow recipes from around the web. For more information about Campfire® Marshmallows, you can find them on them on Facebook and Twitter. 1. In a small bowl, combine graham cracker crumbs and melted butter; stir until crumbs are moistened. Evenly distribute graham cracker crumbs into the bottom of your serving dishes. 2. Spoon about 1 tablespoon of warmed hazelnut spread directly onto the graham cracker crumbs in each serving dish. Top the hazelnut spread with 2 roasted Campfire® Marshmallows and then a layer of strawberries. Repeat layers. Serve immediately. - The number of servings will depend on the size of your serving dishes. Yes, Baby June! They are so ridiculously simple to make, yet so darn pretty! Thanks so much for stopping by! The strawberries are such a fun twist, and who doesn’t like roasted marshmallows! Thanks so much for stopping enjoy, enjoy the rest of your weekend! Aw this looks lovely! i’d love to dive right into one of those right now! Thanks, Jess – they are soooo easy and soooo good! It’s like camping, but in the kitchen! The strawberries make it feel healthier, right? Your photos are just beautiful. Thanks for sharing yet another great recipe. YES! Totally like camping in the kitchen. Thanks so much for stopping by! I don’t know a single person who can resist S’mores. 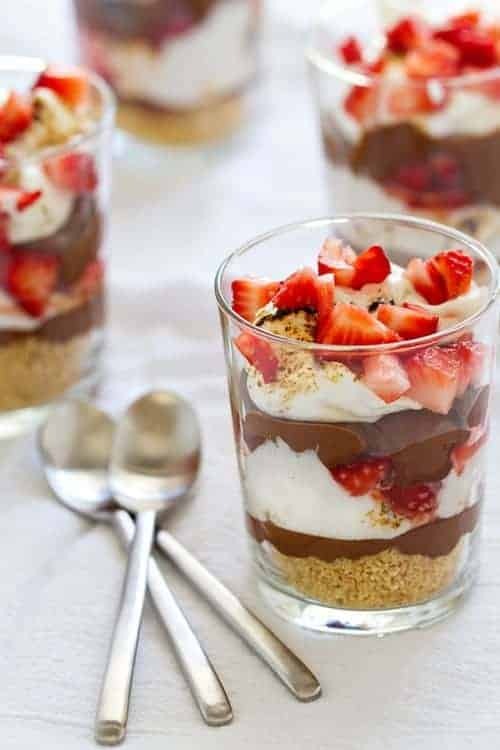 These little trifles look super good! Me either, Emily! They’re my favorite summer treat. Have a great weekend and thanks so much for stopping by! 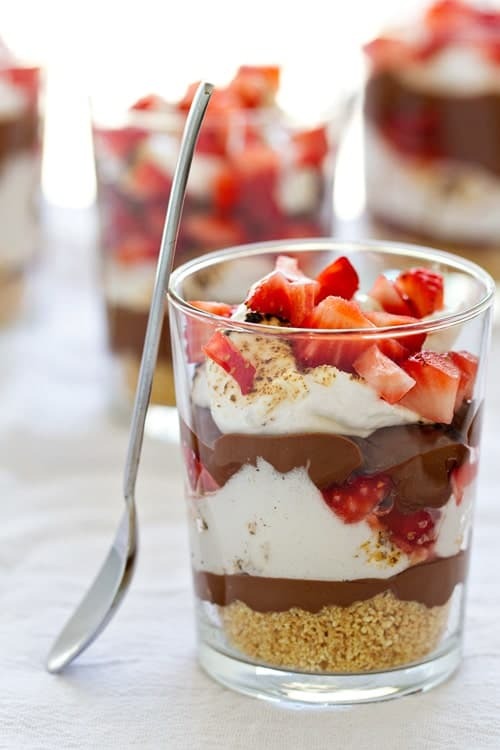 Love this with the strawberries, looks delicious! Thanks so much, Cheri! Have a great weekend. How awesome is this!!!!!!!! Strawberry s’mores sound so perffffect for the Summer!!!!! Love those layers! Every layer has a hidden deliciousness in it! Gaaaah! Can’t wait to make these! I love the layers too! Thanks so much for visiting – have a great day! I am all over these!! So yummy! These look so yummy. I love how quick & easy they sound too. I will definitely have to try them at a summer BBQ. It’s hard not to be infatuated with s’mores. These look amazing. Pinned. These look and sound fantastic!!! How do you normally roast the marshmallows? Also…..can you share your microwave s’more perfection? Although I like a good s’more it’s not usually something that I crave until now…..almost 4 months pregnant! Haha!!! You should see my internet searches tonight….s’more galore!! :). Thanks so much! I typically roast them over the open flame of my gas range on a fork – lol. Be careful if you do this though and make sure to use a long fork or a skewer. For the microwave s’mores, we just pop them in for 20 seconds and allow them to cool before eating – easy peasy. Enjoy your pregnancy and s’mores! Thanks for stopping by. I hope you do get the chance to try it.